An unexpected dividend to my habit of attending random author events is the occasional and remarkable encounter with a fascinating new perspective. 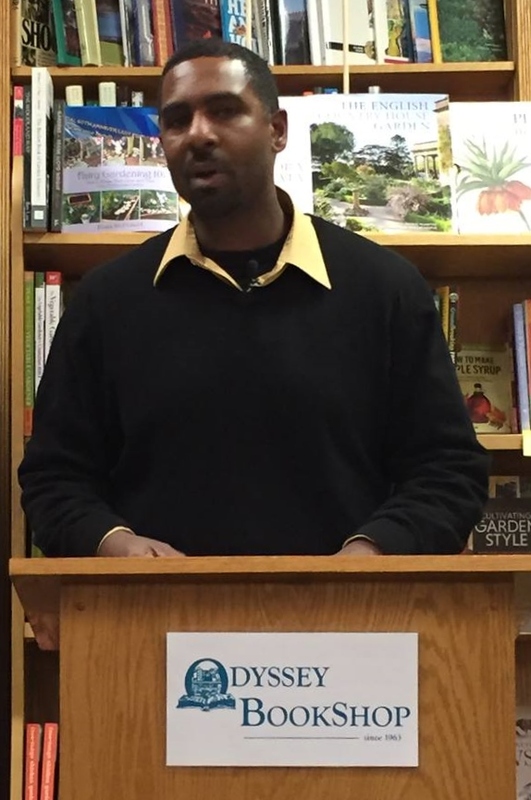 Such was the case when I took my seat at the Odyssey Bookshop in South Hadley MA one evening in November 2014 for a reading and signing of Against Wind and Tide: The African American Struggle against the Colonization Movement by Ousmane K. Power-Greene, Associate Professor of History at Clark University, and left with a signed first edition. I am fairly well read on the American Civil War, especially in its socio-political manifestations, as well as on slavery in the antebellum period. In the course of my studies, the topic of the colonization of blacks back to Africa has surfaced from time to time, but only in the framework of an alleged best recourse for emancipated slaves in what was of course a hostile white society both north and south at the time. I knew this notion was sometimes embraced by Abraham Lincoln and that it met with vehement opposition by Frederick Douglass. While I recognized that colonization was certainly racist and paternalistic, I yet viewed it within a context of benevolence, as least with regard to Lincoln’s intentions. I even sometimes wondered if perhaps such an idea was not so misplaced, given the horror of Southern “redemption” at the end of Reconstruction and the struggle for basic civil rights by African-Americans in the century that followed. Imagine my surprise when I learned from Power-Greene and his marvelous well-researched scholarly book that the actual origins of the colonization movement go back to the 1816 founding of the American Colonization Society, that it was championed by no less of a national figure than Henry Clay, and that its intention was primarily to relocate free blacks to an “African homeland!” I suspect this is a little-known fact for most students of the period and it certainly places a loud exclamation mark on both the concept of colonization and its furious opponents, such as Douglass. The topic serves as a timely reminder that the Free Soil movement in the north was, while indeed hostile to slavery, hostile to blacks as well, and adds a striking dimension to what we already know about the deeply-seated racism of a north that largely went to war to preserve the union rather than free the slaves. Most prominently, it rescues from obscurity the vocal anti-colonization movement peopled by free blacks like Douglass and white abolitionist allies like William Lloyd Garrison. 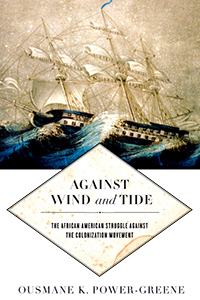 In Against Wind and Tide – the latest installment to the Early American Places series — Ousmane Power-Greene does an admirable job of tracing the roots of the colonization movement and its resistance, carefully plotting the course of the two opposing forces over the nearly half-century that preceded the Civil War. But more than that Power-Greene resurrects a largely forgotten free African-American community of well-educated statesmen, sometimes at odds with one another, who argued for inclusion in the American experience rather than exile to a faraway shore where they could find nothing but skin color in common. I can recall pejorative comments by a fellow white student in the 1970’s wondering aloud what we would study in our “Black History” course after we had covered it all in the first two weeks! Such a statement underscores ignorance more than racism although it contains elements of both: in those days we really had little knowledge of African-American figures beyond the few that briefly dotted our textbooks. At the same time, it is a pointed reminder that outside of those scholars pursuing the subject this remains a large vacuum among most historians. Power-Greene’s book offers a welcome remedy to a gap most of us are not even aware we need to fill. The story of the anti-colonization movement is, like much of history, deeply complex and nuanced. While there were relatively few African-Americans who embraced colonization to the manufactured West African nation of Liberia that sought to serve as a homeland to American free blacks who chose to relocate, they did represent a select minority – and they were frequently castigated by their anti-colonization brethren. At the same time, the anti-colonizationists contained elements of “emigrationists” – almost entirely forgotten by history – who felt defeated by prospects for justice in the United States and saw a thriving future for blacks in Haiti, Canada and elsewhere where they could construct their own communities free from oppression. The larger majority was led by Douglass, whose stubborn allegiance to “stand-and-fight” often led him to deliberately and unfairly conflate the emigrationists with the colonizationists to discredit the former. Interestingly, even Douglass came to briefly ponder emigration in the late antebellum period as hope for any kind of justice for African-Americans in the United States came to seem ever more remote. Douglass’s sagging spirit was reborn during the Civil War, and he famously openly criticized Lincoln for his ongoing flirtation with colonization. If there is a weakness to this book it is that it is a scholarly history book rather than a popular one. It is obvious that it has its roots in a well-developed thesis paper. While Ousmane Power-Greene is a far better writer than the vast majority of scholarly historians in print, the confining structure of style imprisons him to some degree, so themes do not carry as gracefully as they might have had he been writing for a popular audience. But that is a quibble. Moreover, this is a slender volume that focuses upon the somewhat narrow manifestation of the anti-colonizationists. There is a much larger story to tell: about the emigrationists and their communities in Haiti, for instance; about the successes and failure of Liberia; about the many personalities in the free black community who have faded into anonymity. There is a lot more that could be told in a popular history for a larger audience if Power-Greene opts to take on that challenge. In the meantime, I would urge anyone with interest in the antebellum era to pick up and read Against Wind and Tide – you will not regret it!